Thank you, Louie [Martin-Vega], for that warm introduction, and thank you for the opportunity to join you for this 124th ASEE Annual Conference. I was impressed by your theme for this conference: "Where engineering education takes flight." I often speak about the importance of STEM education, so I am delighted to be among people who take the "E" in STEM - Engineering - just as seriously as the National Science Foundation does. 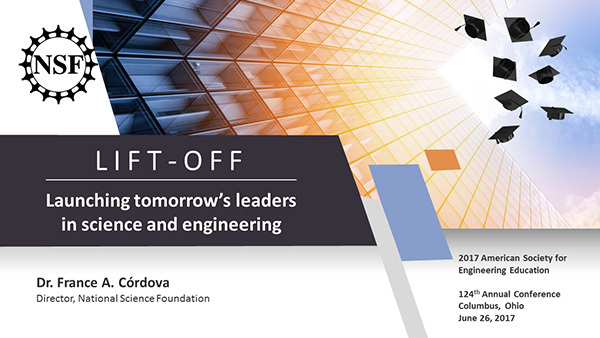 And drawing on your conference theme, the title of my presentation is "Lift-Off: Launching tomorrow's leaders in science and engineering." When I asked Louie what I should cover, he quickly said, "Talk about yourself - talk about your career as a scientist, as an educator, as a trail-blazer." I started to object, but he said, "You are a role model - tell others how France Córdova became Director of the National Science Foundation." The great British writer Graham Greene once wrote, "There is always one moment in childhood when a door opens and lets the future in." When I was a young girl, a door opened for me. It changed the way I looked at the world and what I eventually decided to do in life. I didn't know what astrophysics was, but I loved to look at the night sky and ask, "Why are there stars? How are they formed? What happens to them? Why are there so many? Why are some very bright, while others are barely visible?" Asking those questions led me to where I am today. I didn't have many science role models as a young girl, and so it wasn't until I graduated from Stanford -- with a degree in English literature! -- that I realized I could be anything that I wanted to be. So I returned to my unanswered questions. At the time, I was living in Cambridge and saw a television special on neutron stars, which had recently been discovered. An MIT scientist was featured in the film. So the very next day, I went to MIT and asked for a job at the Center for Space Research, which is now the Kavli Institute for Astrophysics and Space Research. Their willingness to take a chance on a young woman with no credentials in astronomy or science was the doorway to my subsequent career. That sort of thing just didn't happen back then, but it shows how much a single decision can transform someone's life. Louie already listed the milestones of my career -- so let's fast forward to July 2013, when I was nominated by President Obama to become the Director of the National Science Foundation. 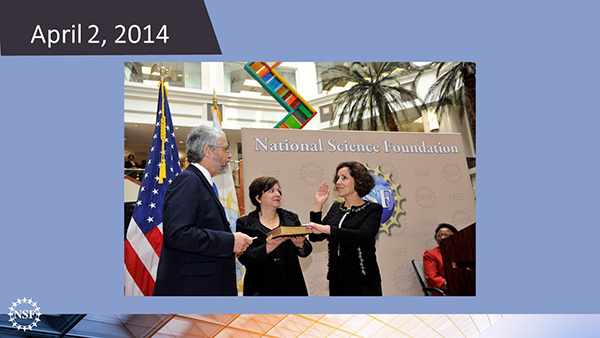 Slide image: Photo of France A. Córdova being sworn in as NSF director in a ceremony at NSF headquarters in Arlington, VA. John P. Holdren, White House science advisor and director of the White House Office of Science and Technology Policy, administers the oath and is joined by Córdova's cousin, Adrienne Córdova. Eight months later -- on April 2, 2014 -- the President's Science and Technology Adviser John Holdren performed my swearing-in at NSF headquarters. I became the 14th Director of the Foundation. 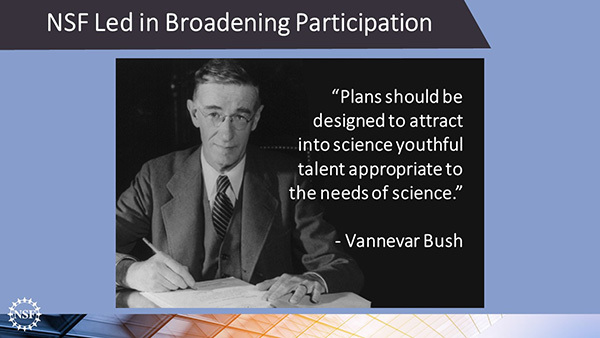 At the urging of visionary Vannevar Bush, NSF was created in 1950. We are the only U.S. government agency dedicated to supporting basic research and education in all fields of science and engineering. When NSF was founded, Bush recognized the need for broadening participation in the nation's science and engineering workforce. He wrote, "Plans should be designed to attract into science youthful talent appropriate to the needs of science." Bush's vision for NSF saw frontiers of science and engineering that were ripe to be explored, and the nation should use its celebrated boldness, and drive -- and above all, its people -- to do so. That entrepreneurial spirit is very much alive in NSF today. Our research has had real-world impact, enhancing the lives of millions of people around the world -- including everyone here! 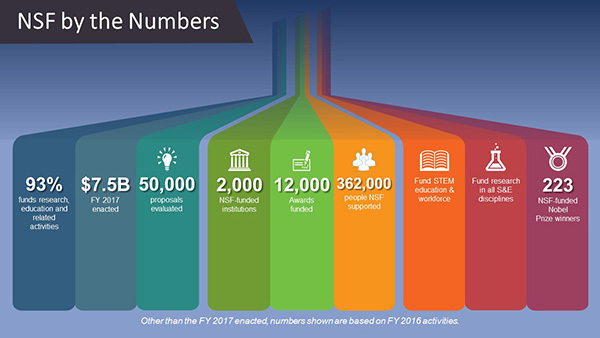 NSF operates with an annual budget that is currently about $7.5 billion, and the great proportion of that -- 93 percent -- goes to support research, STEM education, and development of the STEM workforce. The Foundation's annual budget represents just four percent of the total federal budget for research and development, but accounts for one-quarter of the total federal support for basic research conducted at U.S. colleges and universities. In many fields, NSF is the primary source of federal academic support. For example, in Computing, NSF accounts for 82 percent of federal support -- in Engineering, it's 41 percent. We must be doing something right, because at last count we supported 223 Nobel Laureates early in their careers -- long before they were recognized for their breakthrough discoveries. NSF funds curiosity-driven ideas that push the frontiers of knowledge and discovery. These gains in knowledge have led to breakthroughs with tremendous impact -- for example, 3-D printing, the first detection of gravitational waves, the formation of new stars, the Internet, Barcode enhancements, early web browsers, lifesaving technologies and therapies, and much more. With the rise of self-driving cars, the advances made possible by NSF are becoming apparent in areas such as precision sensors; computer vision, planning and reasoning; real-time data analytics and predictive modeling. NSF funded advances in all of these areas. Not pictured here are iPhones, which incorporate touchscreen technologies; GPS; memory chips; multi-core processors; and rechargeable lithium-ion batteries -- all of which were supported by federal funds. NSF is constantly searching for promising breakthroughs that we can help become a reality -- we call them our "Ten Big Ideas." These are ideas on the forefront of science and engineering that have targeted goals particularly suited to NSF's broad portfolio of S&E, and can be realized with increased future investments. One compelling "Big Idea" is NSF INCLUDES, a new initiative for investing in people, and opening up educational and career avenues for those who are traditionally underrepresented in STEM fields. It builds on and amplifies NSF's current portfolio in broadening participation. NSF INCLUDES stands for "Inclusion across the Nation of Communities of Learners that have been Underrepresented Discoverers in Engineering and Science." It is an agency-wide effort, and I am the "team captain." 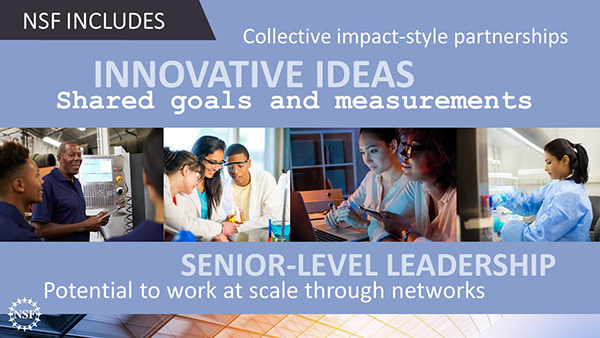 The goal is to create a sustainable collaborative system -- based on an approach called "collective impact" -- that seeks out and builds on partnerships and alliances focused on women, minorities, people of low socioeconomic status, people with disabilities, and other people traditionally underrepresented in STEM fields. I was one of those people. I didn't grow up poor, just middle class, with hard-working parents and 11 younger siblings. I spent my K-12 years ironing our uniform shirts for the parochial school we attended, and folding diapers -- hundreds of diapers. The song I heard most came from the family clothes dryer. When it finished a load of diapers it chimed, "How dry I am." While ironing on Saturday afternoons, I would listen on the radio to car races, and imagine I was an Indy 500 driver. I read a lot of Nancy Drew mysteries and wanted to be a detective. Little did I know that becoming a scientist would lead me to the greatest mysteries of all. Broadening participation is a national challenge that requires national solutions. We want to spark rapid progress to change the balance of diversity in science and engineering. Last year we issued the first NSF INCLUDES awards to 40 pilot projects all over the country. Later NSF will set up INCLUDES alliances, broad-based partnerships that will address ambitious concrete goals which are critical to achieving major advances in STEM inclusion. Science is too wonderful for it to be exclusive, and too important to leave anyone out. We need all "hands on deck" in order to keep America at the forefront of research and development. 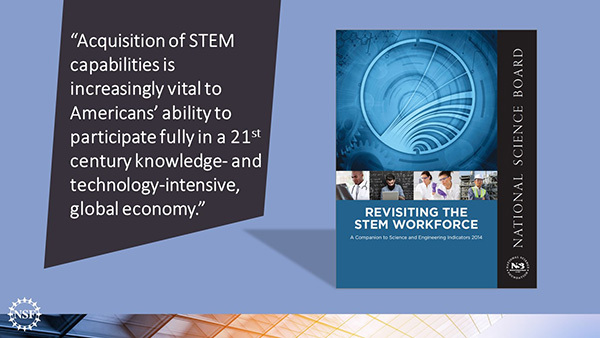 Slide words (quote): "Acquisition of STEM capabilities is increasingly vital to Americans' ability to participate fully in a 21st century knowledge- and technology-intensive, global economy." Slide image: cover of the National Science Board report called "Revisiting the STEM Workforce: A Companion to Science and Engineering Indicators 2014"
This is not just NSF's view. Two years ago, the National Science Board released a report on the state of the U.S. STEM workforce, raising the alarm that we weren't attracting enough domestic talent into S&E fields. The report noted that individuals with STEM skills do not necessarily follow a linear path, going straight from a STEM degree to a job in that same field. In fact, STEM skills enable pathways to many careers, STEM and non-STEM alike. In fact, I'm living proof that there is no set pathway or deadline for STEM Education. 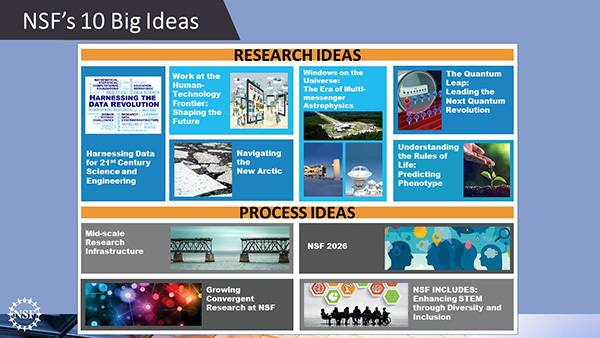 There are numerous NSF initiatives geared toward addressing national imperatives. A few years ago, NSF and the National Science and Technology Council advanced a broad, coordinated federal strategic plan for cybersecurity research and education. We want to develop a cybersecurity workforce that is capable of advancing America's economic prosperity and national security in the 21st century. 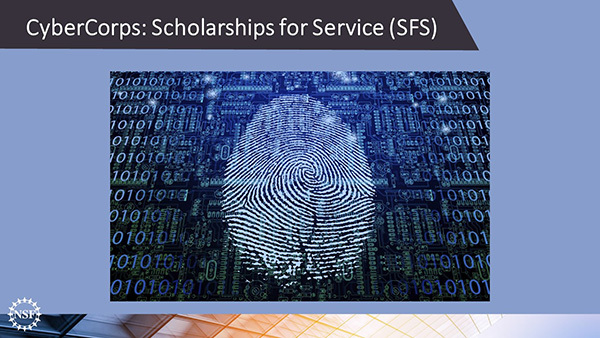 The CyberCorps: Scholarship for Service (SFS) program provides funding for scholarships to students in cybersecurity. In return, recipients work after graduation in government positions related to cybersecurity for a set period of time. 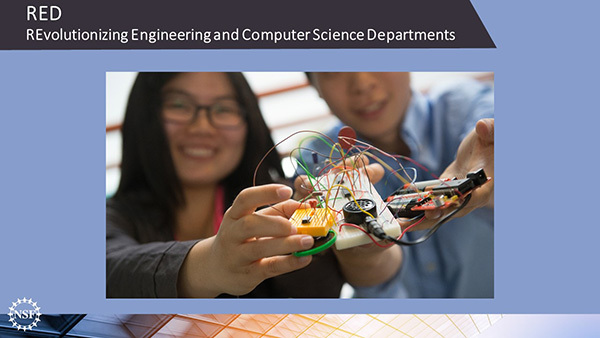 Slide image: photo of Electrical and Computer Engineering students' projects at Colorado State University. Another cyber-related initiative is "Revolutionizing Engineering and Computer Science Departments" -- also known as RED Awards. NSF's Directorates for Engineering, Computer and Information Science and Engineering, and Education and Human Resources have jointly made RED awards to engineering and computer science departments. These five-year, $2 million awards are part of NSF's multiyear effort to help universities improve the professional advancement of computer engineers and scientists. 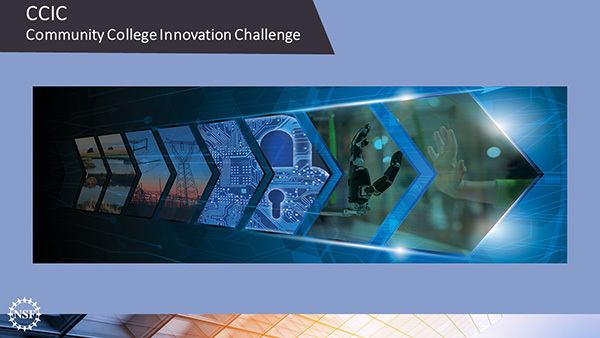 NSF and the American Association of Community Colleges recently presented the third annual Community College Innovation Challenge -- CCIC -- that invites student teams to innovate STEM-based solutions to real-world problems. NSF has even hosted a 4-day Innovation Boot Camp for 50 of our CCIC Finalists. The Boot Camp covered strategic communications, entrepreneurism guided by the I-Corps curriculum, design thinking, sessions for faculty team members to know more about NSF funding opportunities, and more. This program has proven to be popular with elected officials from both parties and is attracting greater interest every year. 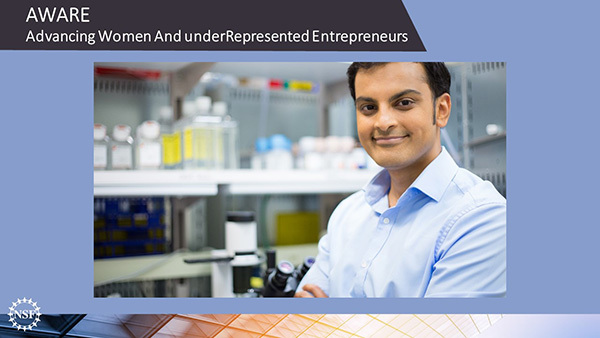 NSF has also funded an exciting program called AWARE, or Accelerating Women and Underrepresented Entrepreneurs at the University of Illinois Research Park, with more universities joining every year. Its goals are "to identify, engage, encourage, and mentor women and underrepresented innovators to consider entrepreneurship as a career path." It also seeks to increase the success of women in competing for SBIR-STTR grants, expand access to networking opportunities, and share best practices. Following the development of AWARE, 50 Fellows -- 30 percent of whom are women -- are now supported as part of the SBIR-STTR Post Doc Program. Thirty-five years ago, NSF started SBIR -- the Small Business Innovation Research program -- to fund innovative 'start ups' with potential for growth. Today many federal agencies fund SBIR and its sister program in universities called Small Business Technology Transfer, or STTR. When I came to NSF, I worried that the number of women PIs in these programs was relatively small. I thought about my own mother, who after giving birth to 12 children, went back to college, was cited as one of the top ten graduates in her class, and then started two companies, one in real estate and one in data archiving. Both companies were successful and a younger sister is the current CEO. Four other sisters have started their own companies. Today NSF is trying to increase the number of women who are starting innovative businesses. Congress also is engaged in this effort and recently passed the "Promoting Women in Entrepreneurship Act." NSF was founded in the aftermath of a world war that brought women into the workplace in far greater numbers than ever before. They helped win the war even as they broke cultural barriers, demonstrating women could succeed and prosper in workforces previously dominated by men. We've come a long way since those Rosie the Riveter days, especially in STEM. 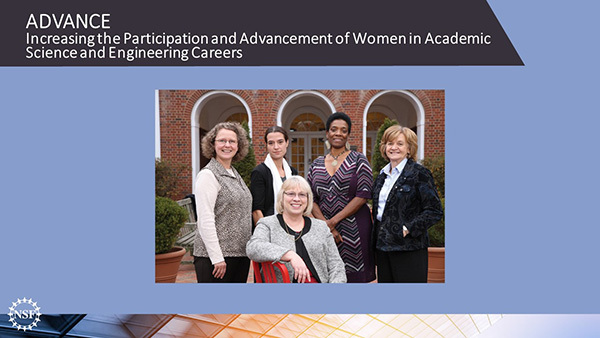 NSF programs like ADVANCE -- Increasing the Participation and Advancement of Women in Academic Science and Engineering Careers -- work at an institutional level to support women in STEM careers and have helped spark large-scale comprehensive change and institutional transformation. Women are still vastly underrepresented in fields like physics and engineering; the number of women receiving bachelor's degrees in computer science has actually declined since 2002. 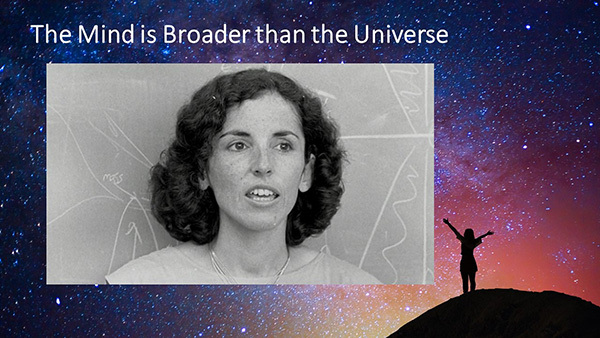 To close these gaps, NSF believes we must promote gender diversity in STEM education, and support women every step along their path to a science or engineering career. And we must also get more girls excited about STEM. Slide image: photo of Garden State LSAMP Scholar Melissa Belot from Rutgers University-Newark explains her research project to Dr. Tasha Inniss, a LSAMP program director at the National Science Foundation, during the sixth annual Garden State LSAMP Conference. 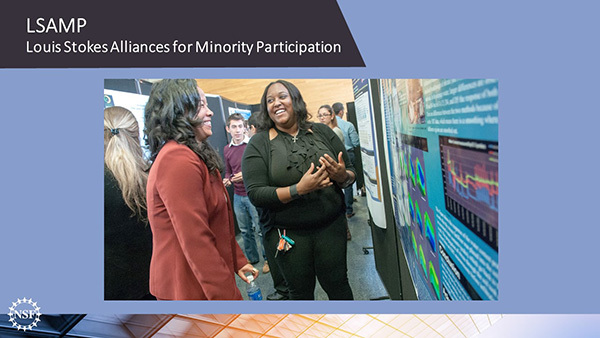 One of NSF's best-known programs for broadening participation is LSAMP, the Louis Stokes Alliances for Minority Participation. This program works to boost the numbers of students successfully completing high-quality degree programs in STEM fields. NSF believes we all need to open the door wider to even more untapped populations. We must give all our citizens a shot at participating in the technological revolutions transforming the U.S. economy. Now we come to the long-standing partnership between the National Science Foundation and you -- the American Society for Engineering Education. At present, NSF funds more than $12 million in ongoing grants to ASEE -- and those grants are among the most important we make. 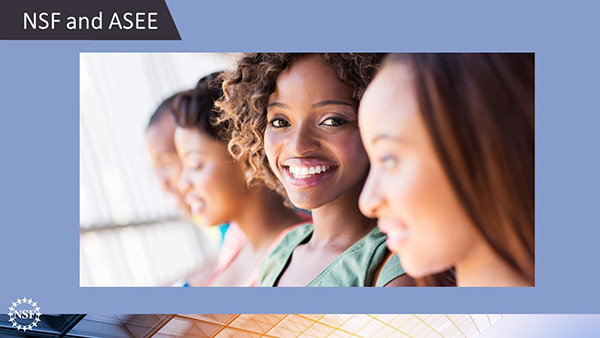 ASEE is currently in the fourth phase of an anticipated five-stage Transforming Undergraduate Education in Engineering (TUEE) initiative that is intended to bring about engineering education transformation. This project is designed to bring together a group of mostly women engineering faculty, practicing engineers, and other professionals to develop a set of action items to improve female participation and success in engineering programs. I can't think of a more important objective for the future of engineering. Thank you again for the opportunity to be with you today. 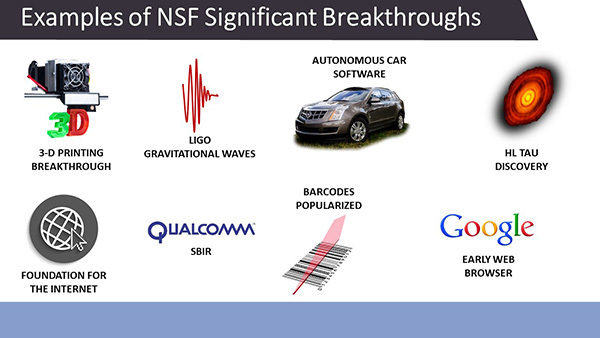 And now let me conclude with a brief video that highlights NSF INCLUDES -- its hopes and expectations for the future.